flying command post the station aboard the aircraft can also be used as an air born store and forward repeater. I highly recommend the file ARRL - B26.TXT for reading. It is the league's official report of its semi-annual board meeting, and contains many things which may be of interest to all of us. Notable, of course, is the election of David Sumner, KLZZ, as Secretary and General Manager of the ARRL. Having worked closely with Dave, I feel very strongly that they could not have chosen a better man for that job. He is known and respected internationally, and is a very bright, forward 1ooking individual, besides being a world-class operator. But also of more immediate concern to the PPRS is the board's decision to fight any amateur license without a code requirement. I believe that it is the general consensus of this group that a morse code test is not desirable for the growth of digital radio techniques. I have long been an advocate of CW, and it is still my much-preferred mode of operation on HF. But I also believe that a code-free "digital" license for VHF data communications is a desirable item in the FCC regulation structure. I would like to see the PPRS consider at its next meeting adopting a resolution addressed to the ARRL and to our Pacific division directors urging them to reconsider their resolution at the last board meeting. 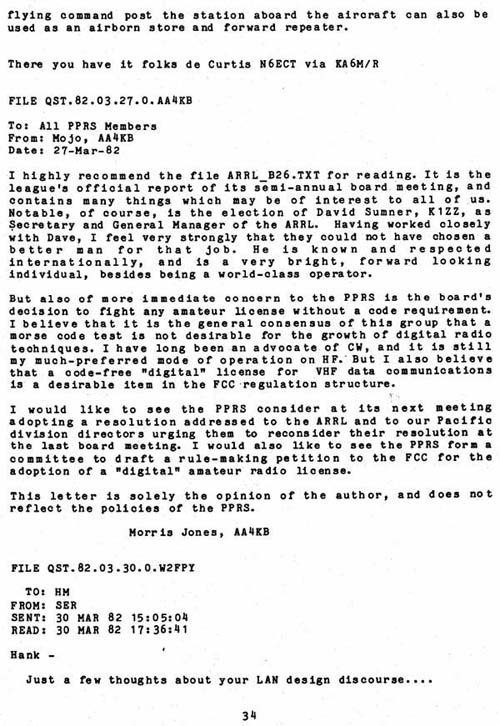 I would also like to see the PPRS form a committee to draft a rule-making petition to the FCC for the adoption of a "digital" amateur radio license. This letter is solely the opinion of the author, and does not reflect the policies of the PPRS.